Today I made a major, major mistake as a father. We went for a walk down to the store to pick up a few things for the house and, hopefully, so Zef might take a snooze. It was his naptime and he had shown all of the signs of wanting to go to sleep. He had eaten 200ml of formula, rubbed his eyes, yawned and had those sleepy baby eyes. The last time he did this we went for a walk and he was asleep before we hit the end of the block. This time he didn’t want to sleep and he only wanted to play. Part of this I think has to do with him not wanting to take his naps as of late and the other part maybe has to do with him teething.Sometimes your beautiful baby wants his or her favorite thing to chew on, particular when their teeth are bothering them and they need that comfort. Here in France, they do things a little different, as you might expect. Every baby, it seems, has a little Sophie la girafe – a chewable giraffe to grind their gums on. Zef, our baby, has one of these and it’s a big hit. Babies also typically get Camilia, a chamomile-based serum to help them calm down, as well the requisite tooth gel. … And when the teeth are really bothersome and your baby is having trouble going to sleep, I’ve been told a little wine (Bourgogne or Bordeaux, parent’s choice) in their bottle does wonders. Apparently, it’s never too young to hit the proverbial bottle. Anyway. I digress. What was my mistake? I forgot the damn chew toy. 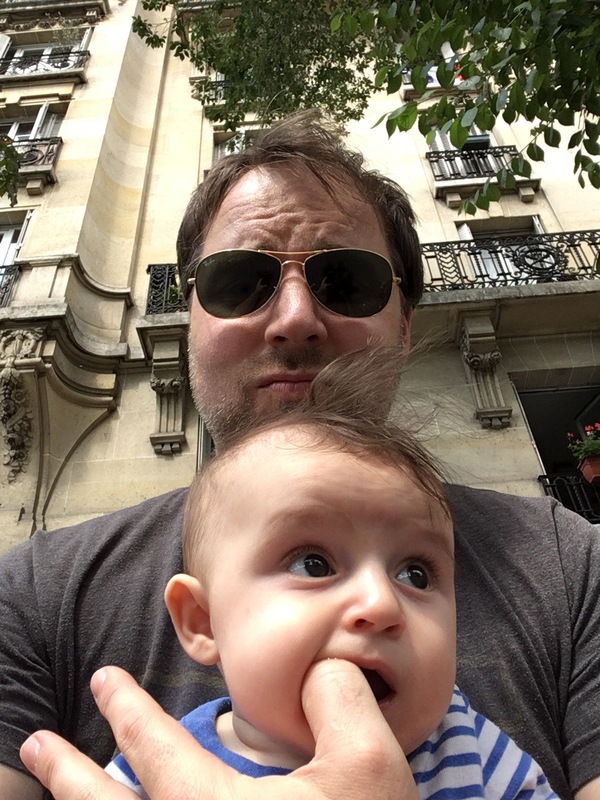 There we were in the middle of a busy boulevard, pedestrians passing to and fro, no doubt glaring at my screaming baby and judging me to be an unfit father, perhaps considering dialing up whatever that French version of Childhood Protective Services is, with no chew toy in sight. So what did I do? Luckily, I remembered that I had packed a spare toy and I did what any good father would. I stopped the stroller, took a seat on a bench and shoved my thumb into my baby’s mouth to shut him up. Half A World Away… There Is Another Stay-At-Home-Writer-Dad Just Like Me Who Also Has To Scoop His Cat’s Smelly Poop! It’s so interesting to see how things work differently (and much the same) on the other side of the proverbial pond. As for dad missteps (the failure to plan kind) I’ve been there. The first time I took Thor to our pediatrician by myself I packed up everything, got him secured, made sure the diaper bag was with me and off we went. We finally get back into the doctors room and the doctor strips him down to check him out. Of course Thor’s diaper was full of no less than 5 pounds of fresh poop. No worries! Dad to the rescue. I throw open the diaper bag root around…and wouldn’t you know it, there wasn’t a diaper to be found. The pediatrician gave me a knowing, “Ah…the new father,” nod and left to go retrieve one. Lesson learned. I check the diaper bag every time we leave now. Good luck with the teething. We take breast milk and freeze it into little popsicles for Thor to gum when he starts getting really upset. For those times when no toy will suffice. It works okay for us. Loved the picture (Zef’s hair is glorious!) and the story. Hang in there! I was just telling my wife the other day that if we followed all of the “rules” we would be frozen in place and not be allowed to do anything on account of all the conflicting info. When in doubt, go with your gut, I say! Haha, well a thumb works just as well as a chew toy. Just can get a tad painful. Sophie la girafe looks cute, but a tad big? I don’t know. The babies all seem to love Sophie!